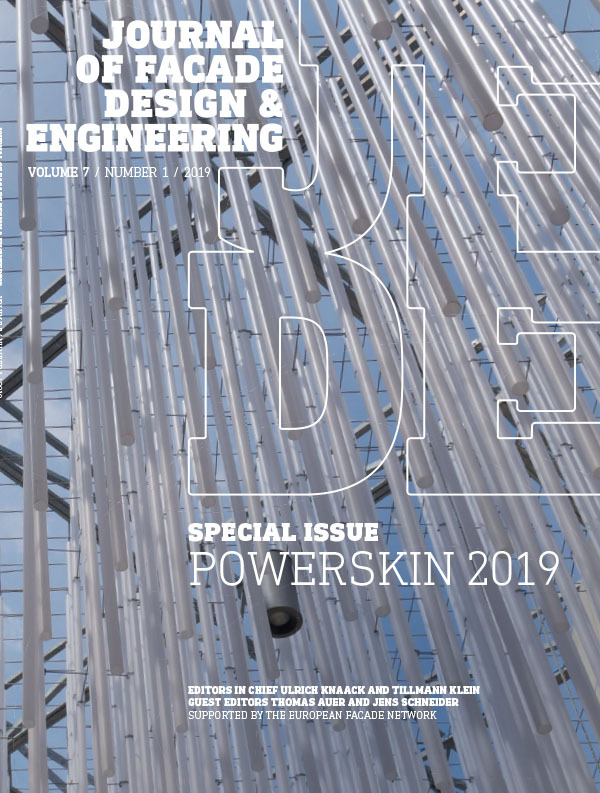 This issue of the Journal of Façade Design and Engineering is a result of the second façade conference, PowerSkin, held on January 17th 2019, in the context of the building trade fair ‘BAU’ in Munich. The conference was organized collaboratively by TU Munich, TU Darmstadt, and TU Delft. All three universities conduct high-impact research and education in the field of building envelopes. The conference featured a mix of practice and education experiences, as well as scientific contributions, and aimed to answer the key question of the 2019 conference: How can digital tools and methods promote changes that aim towards the decarbonisation of the built environment and the improvement of well-being? The 2019 conference focused on the envelope as an integral part of the building and its energy system, as well as the main driver to create comfort. Thus, the envelope is understood in its condition of being a complex interface to the social, economic, and climatic environment in which we build our cities. 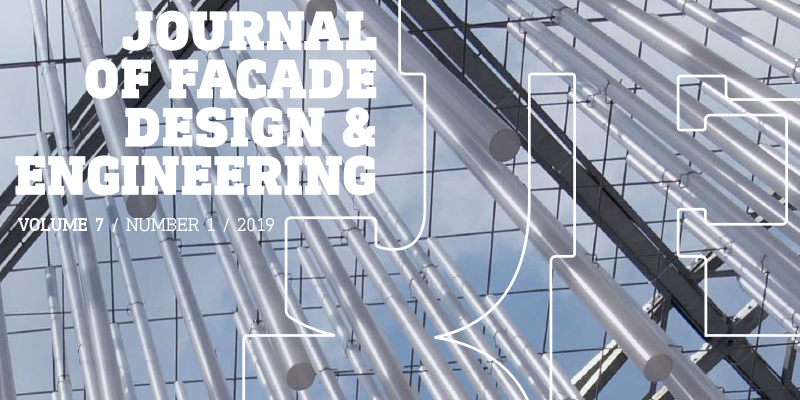 The interaction between these topics, the influences they create, and the digital tools that have been developed and used to design and engineer building envelopes are the main focus points of each of the papers published in this issue. We thank our guest editors Thomas Auer (TU Munich) and Jens Schneider (TU Darmstadt), and their respective teams, who have been key partners in creating this special issue. The glazed envelopes on buildings play a major role in operational energy consumption as they define the boundary conditions between climate and thermal comfort. Such a façade is viewed as an uncontrolled load that sets the operational performance requirements for artificial lighting and air-cooling mechanical systems. This is in contrast to nature, which has evolved materials with the ability to learn and adapt to a micro-environment through self-regulation using materials that are multifunctional, formed by chemical composition in response to solar load. Leaf vasculature formations are of particular interest to this paper. Through leaf maximisation of daylight capture, the total leaf area density and angular distribution of leaf surfaces define the tree structure. This paper will define an approach to simulate nature to advance a microfluidic platform as a dynamic NIR absorber for solar modulation: a transformable network of multi-microchannel geometry matrix structures for autonomous transparent surfaces, for real time flow management of conductivity. This is realised through active volumetric flows within a capillary network of circulation fluidics within it, through it, and out of it for energy capture and storage, the cycle of which is determined through precise management of heat flow transport within a material. This advances transparent façades into an energy system for heat load modulation nested to climate and solar exposure, which is demonstrated in this paper. 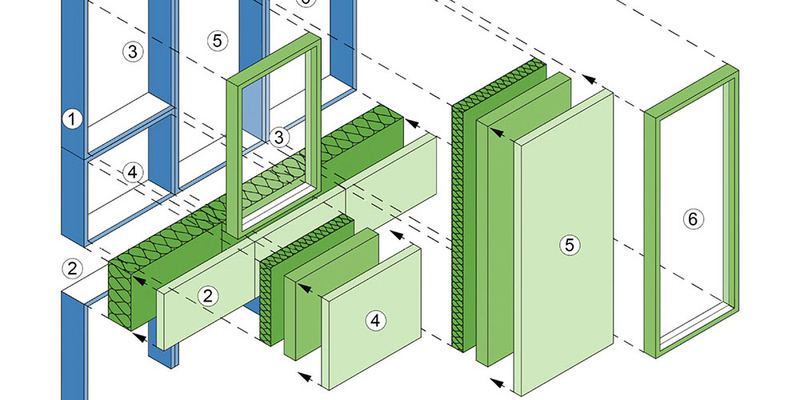 In times of energy use awareness, decarbonisation, and resource efficiency, the performance of well-known façade components must be pushed beyond current limits through innovative designs and new combinations in construction. This paper presents an unconventional redesign of a double skin façade (DSF), based on Trombe wall principles, to enlarge solar gains in heating seasons and avoid overheating issues in summertime. The DSF variant is equipped with a thermal storage mass in the DSF cavity and interior insulation. The thermal mass, in this case concrete, is of a dark colour for high solar absorption, whereas the shading device is highly reflective. In contrast to traditional Trombe wall systems, this TCW is not supposed to actively heat interior space or transfer thermal energy. Instead, the TCW aims to regulate heat flux within the façade level by the management of solar thermal energy fluxes. The potential to reduce buildings’ heat losses through solar energy use is shown and compared to a traditional external thermal insulation composite system (ETICS) with an appropriate insulation thickness for renovation purposes in Switzerland. The U-Value is therefore considerably lower, 0.25 instead of 0.41 for the TCW. 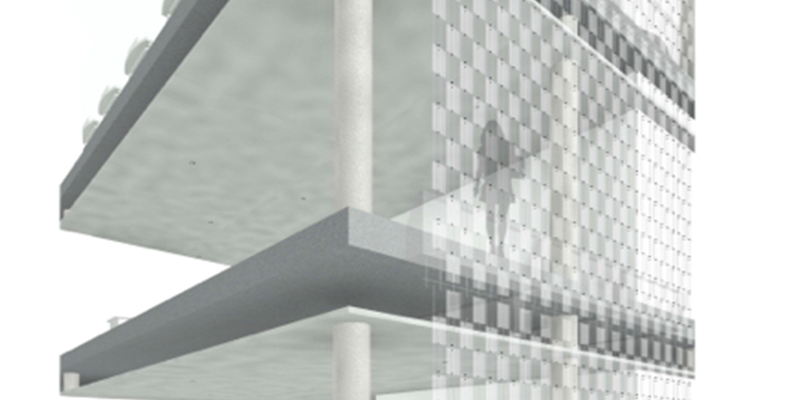 Due to the innovative design and fully transient operation, a highly detailed and flexible simulation tool is needed to analyse and assess the façade performance. The decision to simulate the novel system was made for Modelica-Dymola, with its object-oriented, equation-based simulation language. The simulations of both TCW and ETICS show potential for heat loss reduction due to solar energy storage on every orientation. However, the TCW shows a high solar energy usage due to its ‘natural’ overheating tendency. Furthermore, heat losses are significantly lower than the U-Value predicts and, in some cases, even lower than the ETICS heat losses. 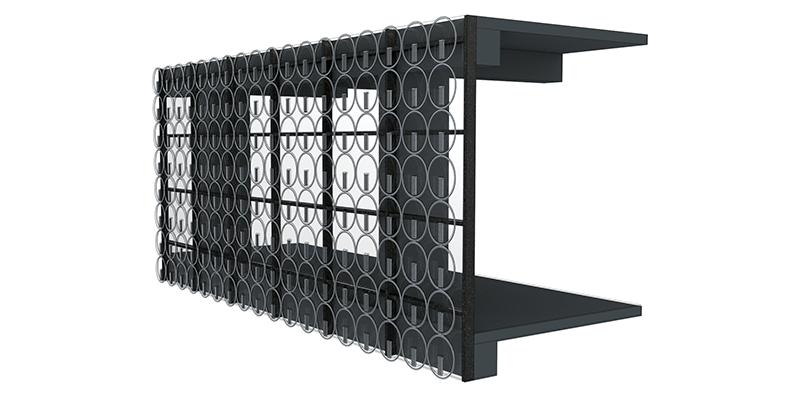 In addition, due to its lower use of material and lower weight, the system can be used as a curtain wall system instead of traditional DSFs, which have higher heat losses in winter and higher solar gains in summer. Thomas Wüest, Andreas Luible, Prof. Dr.
Rammed earth is a technique for constructing sustainable buildings, with a low energy demand encompassing the whole life cycle of buildings. Soil from the excavation can be compressed on-site to build a façade. Due to its hygroscopic and thermal properties, rammed earth façades stabilise indoor comfort, which potentially supports the minimisation of use of mechanical systems. In order to reduce the energy demand for the entire life cycle of buildings, the embodied energy must be taken into account. 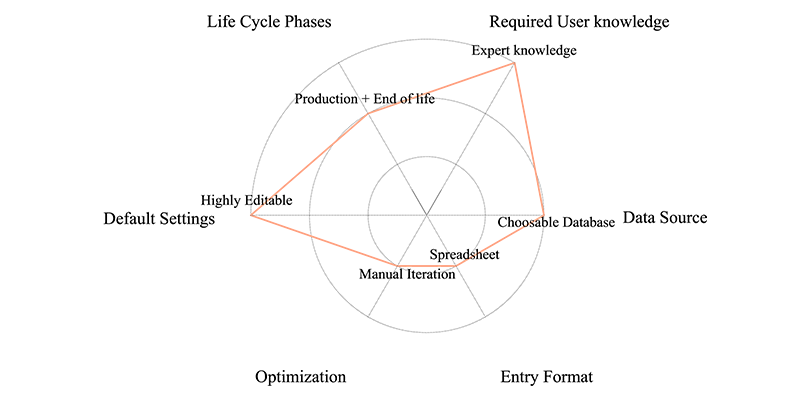 Databases, such as the German Ökobaudat, provide data for a life cycle assessment (LCA). 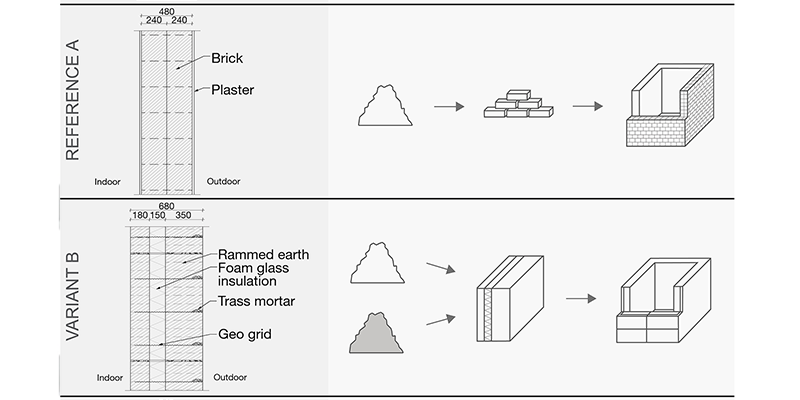 For rammed earth, aggregated data at product stages A1-A3 are provided, but transport, which is included in stages A2 and A4, and construction processes at stage A5 are barely documented. Thus, the energy demand for transport, production, and construction of two rammed earth façades was measured. The results are documented in this paper, which provides a more thorough understanding of the entire building process and helps to expand the database. One can conclude that transportation has the largest impact on the embodied energy of rammed earth façades, so it’s essential to use local material. Furthermore, the results illustrate the implication of transport on a life cycle assessment, as well as for other constructions. Energy savings and indoor comfort are widely considered to be key priorities in the current architectural design trends. Additionally, the well-being and satisfaction of end users is a relevant issue when a human-centred perspective is adopted. The application of Climate Adaptive Building Shells (CABS) compared to conventional façades offers appropriate opportunities for tackling these challenges. This paper reports the outcomes of a study performed on CABS in order to optimise the indoor comfort while calibrating the configuration of a dynamic façade module. The horizontal louvres of the adaptive façade are moved by an actuator that exploits the expansion of a thermo-active resin as it melts, by its absorption of energy. The actuation mechanism depends on the outdoor air temperature conditions and does not require a supply of energy. The performed simulation evidenced a decrease of approximately 4°C indoors when the dynamic module is fully efficient (21st June at 12 p.m.). Furthermore, the lux level is always within the comfort range for an office building (500-2000 lux) during both winter and summer scenarios. The optimised solution shows a substantial gain for energy performance and environmental sustainability. Moreover, the uniformity of distribution of daylight illuminance across the entire space is another associated advantage, giving interesting insights into potentials for architectural façade design. The aim to attain sustainability in the built environment introduced the innovative application of advanced material technologies for low-energy, but aesthetically intriguing, building design strategies. 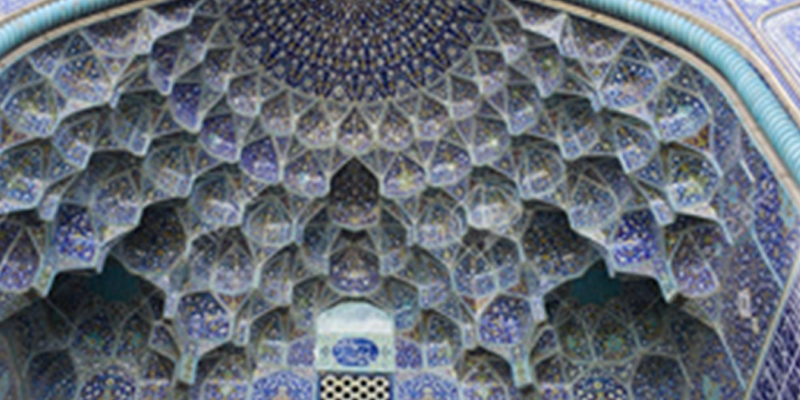 Adaptive and responsive building skins as embedded and intrinsic control systems can be delivered with smart materials, and thus have the potential to minimise the energy consumption of buildings by maximising the natural and passive adjustment of façade components for shading, air-flow, daylight, and view. The dynamic smart material façade, adaptable to changing outdoor environments, is considered to be a holistic design approach that integrates the behavioural performance effects with the appearance and aesthetics of kinetic ability provided by smart materials acting as actuators, by adjusting their properties according to external stimuli. Of the various environmental inputs sensed by, and actuating, active and dynamic building façade systems, this research focuses on temperature as the stimulus to activate a dynamic shading device with the mechanism of opening and closing, specifically considering Seoul’s climate. Among currently available thermo-responsive smart materials, the shape memory polymer (SMP) is investigated as an activator of shading devices to be implemented to adaptive building skin strategies. As the first stage of SMP prototype design and fabrication study toward the thermo-responsive building façade elements, SMP prototypes are proposed in cell types. Among the general thermo-mechanical cycle of thermo-responsive SMP, only programming of the permanent shape via additive manufacturing and recovery at the activation temperature are focused upon in this research. 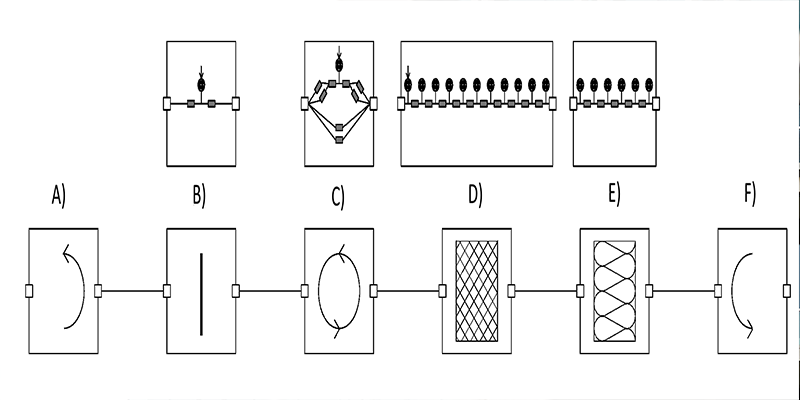 This study proposes a design-to-fabrication workflow integrating computational tools, 3d printing and recalibration of relevant variables in digital design process, G code generation, and manufacturing using commercially available SMP filaments. To verify the 3d printing process, and to demonstrate the shape-changing behaviour of SMP actuators, reproduction of a referenced prototype was conducted, in addition to fabrication experiments of SMP surfaces with various thicknesses and SMP hinges with customised rotating angles. In addition, a base-line prototype combining the static ABS plate and the active SMP hinge is developed to set up the heat test and a digital motion simulation from data of shape changing behaviour acquired from a hands-on model test. After the demonstration of the baseline prototype in design and additive manufacturing process, various SMP prototypes were designed with reference to kinetic prototype researches, but with the consistent 100mm-diameter circular surface, in a scale of 1:3. They were also fabricated with a 3d printer for both open and closed positions to testify to their constructability, and thus to comparatively evaluate the design and fabrication outcomes. Furthermore, after conducting radiation and thermal simulation analysis, shading performance validation is noted for selecting potential prototypes. Lastly, the needs to further develop reversible reiterative shape-changing materials or systems are briefly discussed. Building envelopes in general and, in particular, fenestrations are the places in which most interactions between indoor and outdoor environment take place. As a result, an effective shading structure for windows, which can provide sufficient illuminance levels and at the same time ensure acceptable visual comfort by controlling the glare is highly desirable. Static daylight control systems are mostly designed to either completely shade the façade from sunlight or admit and re-direct it to the indoor spaces. Dynamic control systems adjust the amount of intake sunlight with assistance from users or mechanical devices. Studies to date have not thoroughly and comprehensively developed an alternative system in which a self-morphing structure that is responsive to outdoor environmental conditions can function as an “adaptive daylight control system”. This paper has investigated the effects of the adaptable auxetic shading structure with varying geometries to optimise illuminance levels and reduce probability of glare. The paper developed a model to be tested in various locations in the U.S., to evaluate the illuminance and glare performance. The results suggest that the auxetic shading structure can effectively block sunlight from entering the space by adjusting its geometry in response to varying outdoor and sky conditions. In addition, a strong correlation can be concluded among daylight availability, sun exposure, and glare probability. Additionally, the optimisation of daylighting parameters such as illuminance and glare show a clear correlation between the location of the case study and its corresponding sun angles, and the performance of the shading structure. Future studies may explore the effect of auxetic shading structures on energy consumption and thermal comfort parameters. In addition, the relation between auxetic shading devices and the health and well-being of building occupants may be another factor to be considered in the evaluation of effectiveness of this new generation of shading devices. Façades impact the environmental performance of a building by their passive contribution to operational energy demand and by embodied energy and emissions during each life cycle phase. LCA is a method widely used to quantify the environmental contribution. 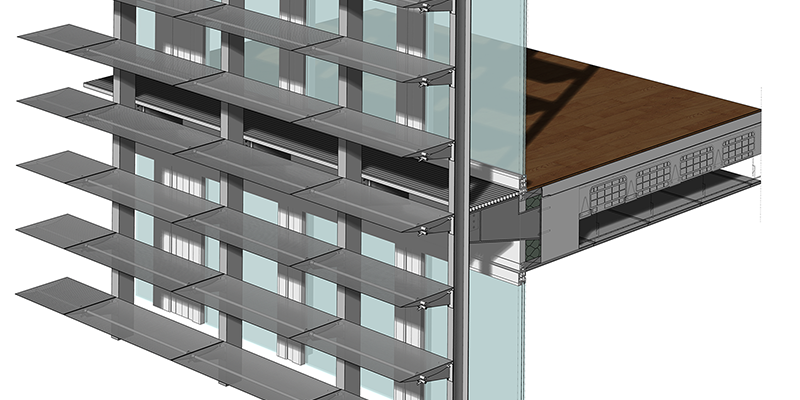 The use of LCA software programs in façade planning can guide design decisions and contribute to environmental optimisation. A large amount of LCA software programs have been developed so far, all of which differ in their focus and requirements. This paper aims to address these differences and investigate the capability and suitability of these programs for façade design. It is structured in four sections. The first part introduces LCA in the building and façade design context. The second part introduces categories to understand the different capabilities of LCA software products. Hereafter, eleven products are evaluated based on these categories. The fourth part focuses on the suitability of software products for simple or complex façades. The study concludes that there are different software choices available for almost every level of user knowledge. While Gabi, Simapro, and Umberto require users to work to a high level of proficiency, software programs like eLCA, CAALA, and 360 Optimi do not require much user knowledge over LCA, but provide a range of other opportunities. The construction of office buildings in particular, as well as multi-family dwellings, are largely based on regular planning grids, and the widths of such grids appear to be repetitive across Europe. In the EU project, PLUG-N-HARVEST, a multi-modular façade system for refurbishment, based on these planning grids, is developed. To achieve a comprehensive improvement of the building´s energy efficiency, different solutions for active and passive energy demand reduction, as well as harvesting of heat and power were combined, while also taking into account the existing building structure, climatic region, and usage profile. The PLUG-N-HARVEST façade is designed to enclose the existing façade like a second skin. Thus, the remaining protection provided by the existing outer shell allows continuous usage. The modular approach enables economic efforts by serial production with a high degree of prefabrication and thus shortened assembly time. At the same time, the toolkit design follows the principles of the circular economy. In visual terms, various façade surfaces will be available to allow both an orientation to the existing building and an aesthetic reorientation. In 2019, pilot buildings in Greece, Spain, the United Kingdom, and Germany aim to show the adaptability of the modular toolkit to different façade geometries and to assess its ecological and economic benefits.